Every year it happens. I go soft. More accurately “softer”. I skip my way through spring, summer and autumn singing tra la las with the odd yodel thrown in, barefoot with flowers in my hair. Then winter does what it has been signed up to do, including such things as “finger numbing frosts” “never arriving but often threatened snow” “doom and darkness” “teeth chattering, leg bending gales”. Of course I know the theory, but it is the physical experience that always comes as a complete shock to me, as if this strange new season had been invented just to spite me. The wind is the worse culprit, it is what George’s dad called “A lazy wind, it can’t be bothered to go around so it goes through you”. It was indeed very lazy. Once out of the inclement elements and back in the snug santuary of home it is nigh on impossible to get warm, “chilled to the bone” as they say. I am not sure of the science of this claim but some evenings as I shiver whilst others melt I envisage my body like a human baked alaska. Next you are inflicted with “glowing cheek syndrome” causing your face to beacon as if you are on your third large sweet sherry martini. Another problem to address is the reluctance to ever ever ever remove your thermals and the associated health issues. The shame is that I know it never gets really cold here, to some our best attempt at severe weather would count as a balmy spring day. So there is no getting away from it, I have once again turned into a fully fledged softie. If previous years are anything to go by I will toughen up quickly, which is just as well as we have only just begun. 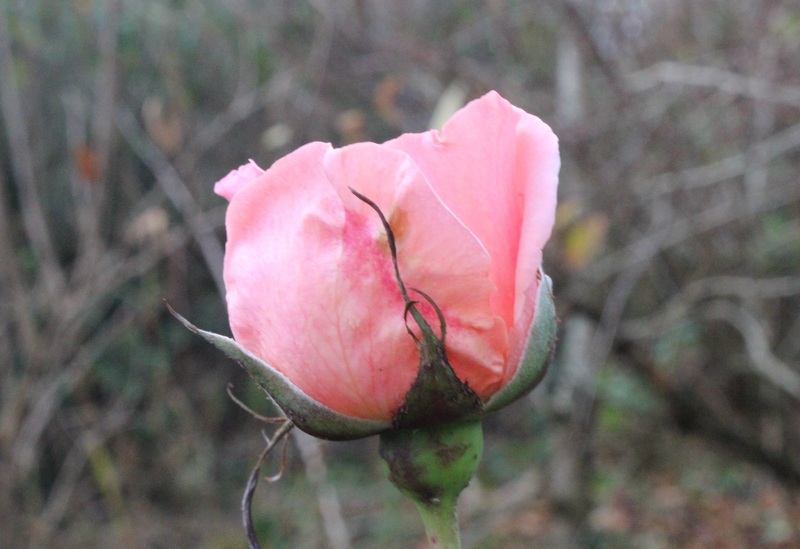 I thought this little rose, gentle in bud, was feeling the same way as me. It just had that look about it. Great word “fluffety”! Your beautiful mittens are far to good to get mucked up in the garden. I do have fingerless gloves which are pretty good. I find that toughening up phase hard too but you did make me laugh at the associated health issues if you don’t take your thermals off. The worst part of really cold weather are the brief fantasies of working inside. I agree, a couple of days of wondering if office work could be an option …… then you come to your senses! But I have to say, the thermals and other warm clothing that’s available now are making such a big difference! You certainly have to be a hardy perennial to be gardening in this weather! Oh the dreaded ‘glowing cheek syndrome’ I miss out on the glow and just go for the full on red! Ha! It last for ages, doesn’t it? Glad to hear there is one who feels the chill as I do, even on a summer evening when everyone else is trying to keep cool. I even have a photo taken on a summer evening when I was 17 bundled up in a wool coat while the other girls were in sundresses. Go figure. I do feel for you, having to garden in the winter. I’ve done a bit of it myself–cold, wet and muddy. Yuck. On lovely crisp dry days it can be lovely but the wet and damp can be soul destroying.